First, at the system level, you have the system energy balance. This provides users with an overview of all energy flows on the generation and consumption sides. The colored areas on the diagram are bordered by total generation and consumption in grey. The colors show where the energy has come from and where it has gone (Figure 1). Under “Energy and power – battery”, the device level shows the key data for the battery system at a glance. The battery display familiar from the system dashboard can be found in the top left. This shows the state of charge and system power. One handy feature is the time stamp above the battery icon, which changes depending on the SOC. It shows how recent the displayed values are (Figure 2). Our measured values were transmitted four minutes ago. Everything’s fine. PV system operators can also use the chart to view past battery usage and how the state of charge has changed over the previous hours, days, weeks or months. Many customers, particularly those operating on a commercial scale, use multiple battery inverters, e.g., in the Sunny Island Multicluster format (Figure 3). For these systems, just as for PV inverters, Sunny Portal powered by ennexOS offers a range of visualization options at the device and system levels. 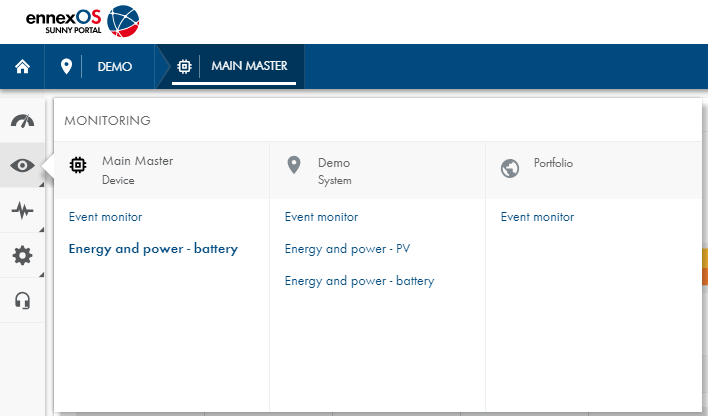 For the first time, the energy and power values can be displayed in Sunny Portal at the system level alongside the existing data at the inverter level. The state of charge thus constitutes a mean value for all batteries in the system – weighted by their true capacity, of course. Tip: If, on a given day, you view the “Energy and power – battery” screen at the device level and then go through the monitoring menu (Figure 4) to switch to “Energy and power – battery” at the system level, the day that you had previously selected will be adopted. This means that the SOC curve in the multicluster can be shown, for example (Figure 5), and that for the first time system errors can be detected at a glance in Sunny Portal. If a battery reaches a full state of charge very early or frequently becomes warmer than other batteries in the cluster, for example, this may indicate a battery defect, which means that the operator can take action to replace the battery before any unexpected system failure occurs. Measured values for all system devices can also of course be compared on a diagram (Figure 6), or the events that occurred during the period under analysis can be listed. Tip: Operators can use the event monitor filter to gain a better overview of the events in a given period. Incidentally, in Sunny Portal powered by ennexOS, you can display deactivated or replaced devices via Analysis Pro with a single click. To do so, simply click the “Display shut-down devices” button and the entire system history will once again be shown. The analysis tool helps you identify potential failures early on and saves both money and unnecessary work. Why not try it out for yourself?